It started on Sunday. There we were, eating cinnamon buns, when a neighbor knocked on the door. “It occurred to me you probably don’t realize today is the time change,” she said. Daylight Savings? Uh-oh. We are a little unplugged up here on the mountain — no internet that doesn’t require a hike, no phones, no tv — and so, no, we didn’t realize. And now we were late. There was instant scurry, things flung every which way, a mad scramble for the bathroom, a dash out to the car, skidding laughing down the mountain on an icy road. I am not a fan of Daylight Savings Time. And now that we have sprung forward, I have a persistent feeling that I am lagging behind, missing something important. Even up here, cut off from civilization, the clock doesn’t agree with my internal time table. Is it seven or eight? 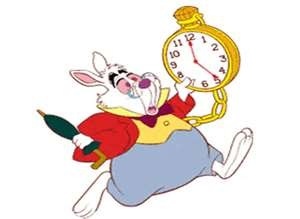 I feel like Alice’s rabbit, late late late for a very important date. All around us, life is springing forward in disconcerting ways. There is a sledding hill across the street from our cabin, a long and twisting driveway. The hike up it is asthma-inducing; to stand at the top and look back you feel it’s quite impossible you made it up at all. Then there is the moment you sit on the devil-may-care device and feel the world beneath you begin to slip — and you’re off. Once you’re going, there’s no stopping (short of a crash); none of your shrieking makes a difference. Our kids are like that — teetering on the edge of a thrills-and-spills ride from innocent childhood into their own great adventures. I see the world beneath them start to slide, the sled is moving, none of my shrieking can stop it. They say busyness is the great enemy of marriages: hurry, worry, distraction from what really matters. The simple things, intentionality and care, are too hard to cultivate when you’re running 100 miles an hour. It’s not just marriage, it’s anything slow and painstaking — the spiritual life, the writing life, your very heart. Feed it rush and scramble, watch it wither. We are under the illusion that we control our calendar and own our possessions. Ha! We’re like Voldemort, divvying up our soul into precious pieces and thinking, spread out, there is more of me to go around. Be careful where you stash your life. But the clock cannot tell me how to live my minutes. I choose. And today I choose to savor, even as the world is whipping by. I won’t be rushed, won’t give in to worry, hurry-scurry. Today is a gift, and though tomorrow everything may change, today I have children I don’t have to nag, battles I can pick, a husband I can lavish with love, a view I can stop to see. All of my fears won’t add a minute to my life, so I show them the door. You go ahead and spring forward. I think today I’ll fall back.